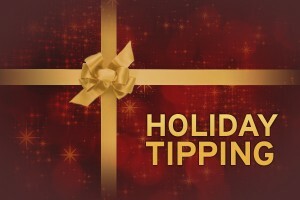 Given all that, Sapphire homeowners can scarcely be faulted if they haven’t given a lot of thought to holiday tip giving: who, how much…the usual conundrum. I thought I would do some current research and offer everyone some guidance, but I should warn you: I didn’t find much. I thought the answer would lie with Dr. Wm. Michael Lynn, the tipping universe’s reigning academic expert. In case you never suspected there was such a field, you should know that Dr. Lynn is the Burton M. Sack Professor at Cornell University. Although, technically, Dr. Lynn’s professorship is in “Food & Beverage Management” (and before the holidays are over, some Sapphire homeowners may wish they’d paid more heed to their own personal beverage management), his most important work has been on the subject of tipping. Unfortunately, when I delved into some of his thoughts so I could share them with Sapphire homeowners, what I found turned out to be a little more technical than expected. I’d hoped to find something like “hairdresser: cost of a session” or “babysitter: hourly rate x 4” — some cut-and-dried guidance like that. Instead, I found research papers on topics like the relationship of tips to waiters’ and waitresses’ shirt colors (wearing a black and white shirt gets better tips than red); whether religious people are poor tippers compared with less religious people (not really, unless the service is really bad); and how the desire for social approval motivates tipping of car guards in South Africa (I’m still not sure what a ‘car guard’ is).